Teaching on stages around the world and styling A-list celebrities at Hollywood events. Jet and Rhys have built quite an impressive resume. They have been the creative force behind glossy, swingy manes for national television and print ads of companies like ABC, Revlon, Pantene and L’Oreal Professionnel, in addition to teaching fellow professionals on stages in Japan, Mexico, Australia, The United States and Europe. 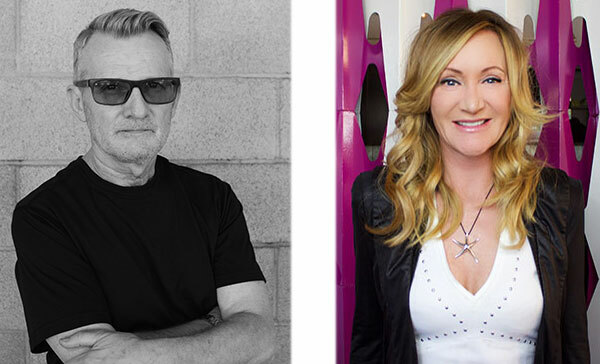 Jet and Rhys were professionally trained at Vidal Sassoon, where Jet was the salon’s former New York Color Director and personal colorist to Vidal himself, while Rhys was a Vidal Sassoon Art Director. Known for her upbeat wit, as well as her innovative, unparalleled color-passion, Jet’s motto is, “look, study and attack.” An absolute maestro in working with natural color and skin tones, eyebrows, hair texture and bone structure to create a harmonious, signature style, she evolves the looks of the clients in her chair based on “honest” beauty. It starts with creating the perfect, healthy hair canvas for color to come. Creator of the Jet City video guide to color techniques and the Jet Rhys Color Cocktail—the shaken, not stirred color refresher—Jet focuses on the ideal, image evolution. Rhys’ cult following comes from his ability to “read” hair like the pages of a book. His precision cuts and incredible styles are as personalized as DNA, which is why clients drive as much as 150 miles just for a Rhys haircut. Also focusing on style evolutions, he has the ability to make changes that work with lifestyle shifts, switching from short textured cuts to long swingy styles with ease. If you’re transitioning lengths or layers and have problems with “grow-out,” Rhys is the go-to stylist for the fix. Founded in 1992, their eclectic, creative salons are as inspirational and welcoming for celebrities as it is for their diverse clientele. Located in San Diego, CA and Solana Beach, CA, Jet Rhys Salons are architectural masterpiece’s synonymous with superb hair design and technique. Each member of the Jet Rhys team is an expert in their field and has been personally trained by Jet and Rhys. An ongoing education program ensures staff members stay updated with the hottest looks and trends from around the world. At Jet Rhys, stylists strive to look beyond clients’ bone structure and skin tone to find their real persona and create the perfect hairstyle. In addition to expert coloring, precision cutting, and inspired styling, Jet Rhys offers Japanese thermal straightening, high-quality natural hair extensions using 100% natural hair, the Brazilian Keratin Smoothing Treatment, makeup and waxing services as well as the latest L’Oreal Expert Molecular Precision Haircare technology. Jet Rhys Salon has been featured in numerous fashion and beauty publications such as Harper’s Bazaar, Allure and Vogue. Jet and Rhys were recently recognized by Self Magazine as one of the top salon teams in the United States. For more information, visit www.jetrhys.com or call 858 345 1895.